Some months ago, I was in the South of Thailand for some sun, sea, and sand. From our base on Koh Lipe, we hired a long-tail boat for a customary day of snorkelling. Our first stop: Koh Hin Ngam (the Island of Beautiful Stones) in Satun Province. Our captain dropped anchor and told us to take pictures. So we got off and took pictures. (We were obedient tourists.) Contrary to the name, not the entire island is covered in beautiful stones. Only a small part of it is – a small peninsula that juts out into the Andaman sea. 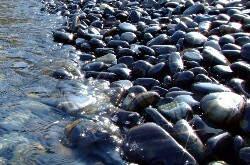 Nevertheless, the glistening black stones make for a spectacular sight. We spotted a number of stone towers and promptly built our own. I only found out later that, apparently, if you build a tower with 12 stones (no easy feat), you are granted one wish from the Stone God. I don’t remember how many stones we piled onto our rickety structure, but I’m pretty sure we didn’t manage 12. Ah well. The mini peninsula being covered with stones, there were no trees to shade us from the blazing late-morning sun. The heat reflecting off the stones under our feet didn’t help either. So we didn’t dawdle too much. Pictures taken, stone tower built, we started to make our way back to the boat. That’s when I spotted it – the most beautiful stone I had ever seen. Shape-wise, it was no different from any other stone: small, oval-shaped, with dents here and there. But its colour was magnificent. The stone was the most beautiful and uniform shade of blue. Unlike anything I’d ever seen. As I turned it over in my palm, I was overcome with an irresistible urge to take it home. I could picture it on my night desk, the perfect souvenir. No one would ever know. After some dithering, I took a picture of the stone, and we left for our next snorkelling spot. Why didn’t I take the stone? Now, that is the question that I’ve been raking my mind to find an answer for. However hard I try, I can’t seem to come up with one. Left to their devices, why wouldn’t any rational being take a stone as a souvenir? I learnt later that it’s bad luck to take a stone from the island. But is it the superstition, or the logic that governs our decision not to take a stone? In my case, it was anticipated guilt. If I took a stone from the island, I would feel that I was stealing from nature, removing something from its rightful place and tampering with the local ecosystem. I’d feel bad about it after, so I didn’t take it. I guess in a way this decision was logical. It was a result of careful deliberation of the emotional consequences of my action. But, for the sake of argument, let’s factor guilt out of it. Why would a rational being who wouldn’t feel any qualms about taking a rock from an island semi-full of rocks not take a rock when they won’t be persecuted for taking it? But of course that doesn’t make sense. Me taking or not taking a stone in no way influences others’ decision, provided I don’t go around showing off my stone to other people and telling them it’s okay to take one. So really, unless I missed something, there is no logical reason for a guiltless person not to take a stone. What about superstition then? It’s bad luck to take a stone from the island, so you should not take one. Superstition, to me, is an absence of logic. You are nudged into action or abstention based purely on stories to which there is often no scientific evidence. Or evidence hinged on minuscule statistical probabilities. Often one hears of locals in rural Thailand rubbing “magic” trees to get lottery numbers because someone has been blessed by the Tree God with a million baht in their pockets. But thinking of the case of the stone, I cannot help but wonder whether superstition which I treat with such disdain is responsible for keeping the ecosystem intact. Since, as we’ve established, there is no logical reason for a guiltless being not to take the stone. Could it be the superstition that’s stopping us? “Taking a stone is bad luck.” Is this simple sentence what we have to thank for the island semi-full of beautiful stones? Can individuals be refraining from taking a stone, not because of any logical reasoning, but for fear of the wrath of the Stone God? It’s a question that’s difficult to answer. But not for lack of attempt. Dig a little and one finds numerous articles and essays on the power of superstition. It’s a fascinating field. Of course, not every people believe in superstition. Countries differ. Even regions within countries. Transpose the island of stones into a different culture and we may have a devastatingly different result – a stoneless island ravaged by rational beings who do not believe in silly superstitions. And of course, individuals are not guilt-free. For whatever reason, a person may foresee feeling guilt and therefore abstain from taking a rock without necessarily thinking of the logic or succumbing to superstition. So, having reached the end of the post, I am none the wiser as to why fellow tourists are not taking stones from the beautiful stone island. I think it’s superstition, but I have no proof. And that frustrates me a little. Is there a logical reason why one should not take a stone from the island? Is leaving guilt out of the equation a fatal flaw to my argument? Am I missing something? Please share. I’d love to hear what you think.